January | 2007 | That Mall is sick and that Store is dead! 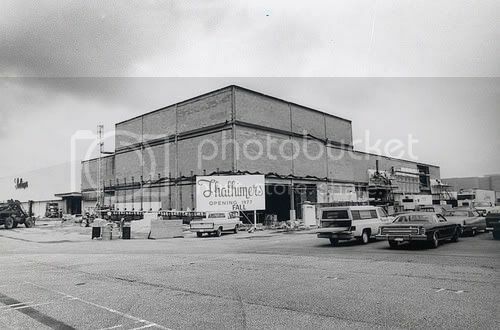 HAMPTON – Tearing down Coliseum Mall was not part of the initial renovation plan. 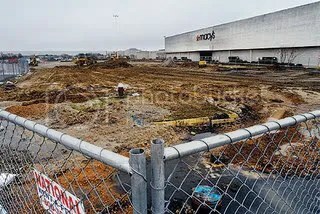 Today, the former Dillard’s department store is gone, and wrecking crews are poised to raze much of what’s left of the 1 million- square-foot mall just off of Interstate 64 and Mercury Boulevard, near the Hampton Coliseum. In its place will rise Peninsula Town Center, a network of streets and buildings featuring residential, office and retail space with a construction price tag of more than $200 million. The town center will be more of a destination, said Justin Leyda, a development executive with Steiner and Associates, the development group working on the project with the center’s owners, Mall Properties Inc.
Poquoson residents Richmond and Charlotte Long, shopping in the mall on a recent Monday, welcome the changes. “It’s lost its appeal,” Richmond Long said. The city of Hampton certainly thinks so. It projects that Peninsula Town Center will generate $6 million a year in tax revenue once it’s completed and businesses are open in 2009, said Kathy Grook, a senior development manager in Hampton’s economic development department. In recent years, she said, the mall, which opened in 1973, has produced about $3 million a year in tax revenue. 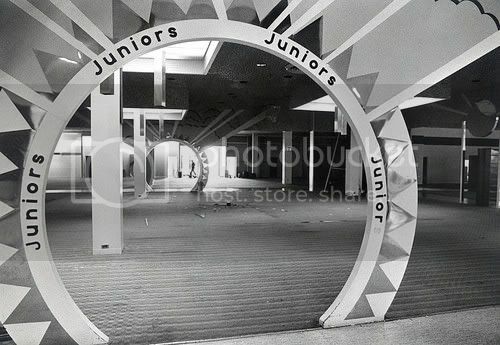 Before the new town center can emerge, the old mall must be torn down. 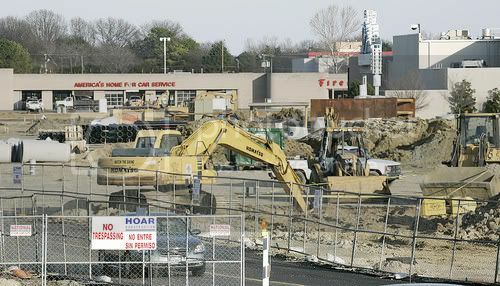 Getting the mall ready for demolition is no easy task, said Tripp, who has managed Coliseum Mall for 16 years. Tearing down the mall includes helping to relocate dozens of tenants, putting on a job fair for more than 50 employees who will lose their jobs and finding a place for the Mall Striders walking club to exercise, Tripp said. The next phase of demolition is tentatively scheduled for March, but Tripp said he’s got to make sure all of the tenants are out first. Even though the mall closed in mid-January, a handful of stores remain open. One issue has been access to the mall’s LensCrafters, which is tentatively scheduled to relocate in mid-February. The eyewear store’s exterior mall entrance is in a construction zone, so the mall’s interior is being kept open until LensCrafters’ temporary location at the nearby Mercury Plaza is ready in late February or early March, Tripp said. Other retailers still open at the mall are Barnes & Noble, Burlington Coat Factory, JC Penney and Macy’s. The bookseller is scheduled to close around the same time as LensCrafters and the coat factory will permanently relocate to a new building at Mercury Plaza. Even after all of the moves are made and Coliseum Mall comes tumbling down, Tripp said his work will not be complete. Reach Michelle E. Shaw at (757) 446-2667 or michelle.shaw@pilotonline.com. I actually got to go down there today. My dad gave me a ride. 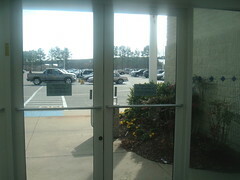 This was one of the only mall entrances open. I only did a walk around and a trip to Barnes and Noble. Everybody was having a moving sale except for the chain stores who I assume are just shutting down and moving. That’s what Bath and Body Works had in mind. The food court was dead. The closed Chick-a-Fila (I wish I took a pic of it now but I was scared of security) still had red Christmas garland on it, and the door to the kitchen had been taken off its hinges and it was out at the counters, and there was a sign on it about how employees would be charged with shoplifting if they were caught taking food before closing. 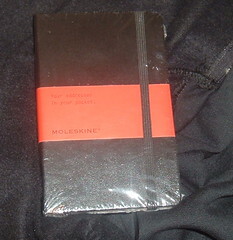 I went to Barnes & Noble and got a green tea frappichino (the only one I like, if I want coffee I’ll get a hot cup of coffee, not some frou foru drink), a fabric stretchy book cover for my Literature book, and an old style Moleskine address book. The anchors are still staying in their spots until their new buildings are built. 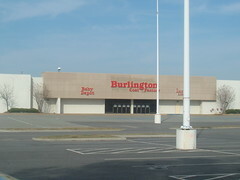 I dunno about crapppy Burlington though, its rumored that they’re moving piratically back to their old location. Channel 13had a camera woman out when I was there, and I recorded the news tonight. It’s gonna be a while before I can upload the video though ’cause I gotta put it on a DVD and I gotta fill up the rest of the DVD and blah blah blah. So that’ll take a few days. The first mall built on the Peninsula is closing its doors on Sunday. 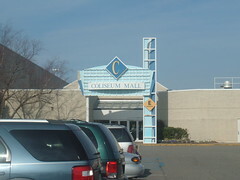 Coliseum Mall is being torn down to make way for the Peninsula Town Center. 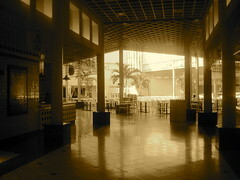 The mall was built in 1973. 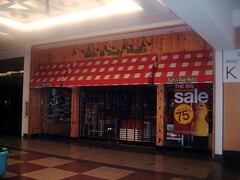 Over the years the structure was renovated, but owners believe it is time to update the shopping center. Some people are looking forward to the new shopping area. “I really think it is going to be very nice. I think it’s going to bring in more revenue. More jobs and make our city look better than what it looks right now, ” said Mone Gilliam. Then there are those who like Coliseum, as is. “You become familiar with the clerks and therefore it become like a family environment around here. Now, you won’t have that,” said Billie Jean Neil. The new Peninsula will cost around $200-million dollars to complete. 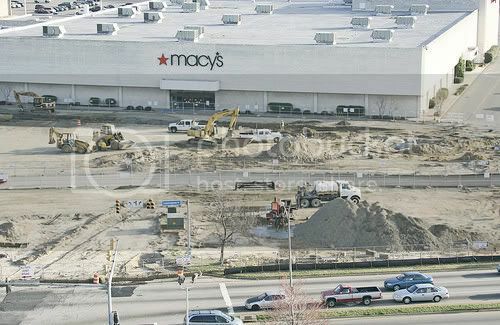 During the construction phase, Macy’s Department store will remain open. Barnes & Nobles, Burlington Coat Factory and JCPenny will remain open until the stores’ new buildings are ready. The Town Center is scheduled to open in 2009. Most stores will close Sunday, as the 33-year-old mall gives way to the open-air Peninsula Town Center. 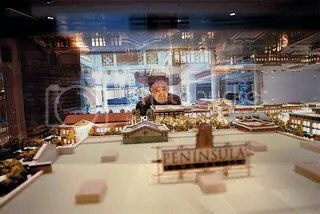 HAMPTON — At Coliseum Mall on Thursday, Norma Reed peered at the miniature model of the Peninsula Town Center, which will replace the mall that would turn 34 years old in October. Reed, who has been living in Hampton for 40 years, remembers when the mall opened on Halloween in 1973. In two days, most of the stores that are still open at the mall will close their doors for the last time. 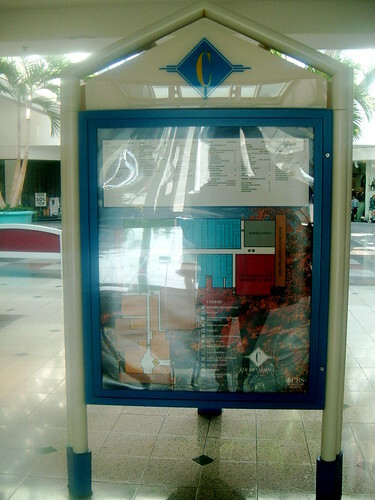 Demolition is scheduled to begin in late February, and construction of the Peninsula Town Center is set to finish in April 2009. Macy’s, J.C. Penney and Burlington Coat Factory will remain open throughout most of the construction; the latter two will close briefly in order to change locations. The three free-standing restaurants – Steak & Ale, Bennigan’s and Outback Steakhouse -will also remain. A handful of other stores, including Barnes & Noble, Life Uniforms and Lee Nails, will stay open until mid-February. Declining sales and the growing popularity of outdoor shopping centers were factors in the decision to give Coliseum Mall the $207 million makeover, according to executives at New York-based Mall Properties Inc., which owns the mall. Retail sales dropped from $142 million in 1999 to $112 million in 2004. 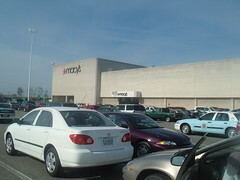 In 2005, it declined further to $99 million, in part because some stores didn’t renew their leases and left the mall. According to Ross Mugler, Hampton’s commissioner of revenue, Coliseum Mall made up to 20 percent of the city’s taxable sales in 1992. In 2005, the mall made up about 11 percent. Local newspapers carried stories about Coliseum Mall starting in 1970, when the city announced the development. 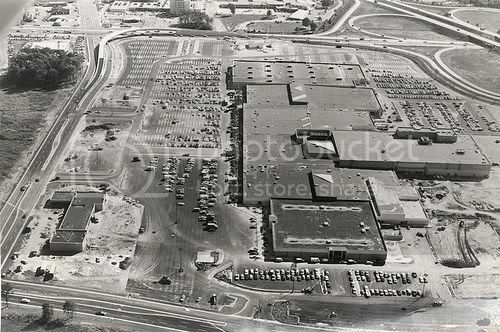 A Daily Press article published on July 9, 1970, reported: “Fully enclosed, the center will be 100 percent climate controlled.” When it opened on Oct. 31, 1973, it was the biggest mall on the Peninsula, anchored by three big-name department stores: Korvette, Rices-Nachmans and J.C. Penney. About 50 stores were open on that first day. J.C. Penney is the only original retailer that still exists. 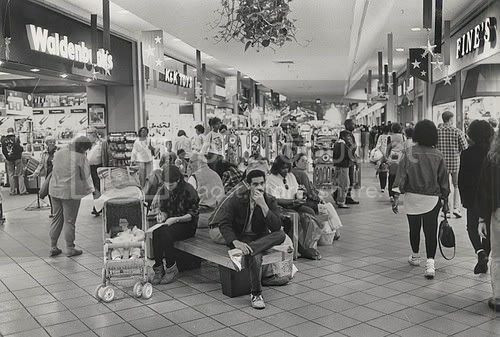 The mall was a popular site for community events throughout the 1970s and 1980s. Art competitions, health fairs, bird shows and cake-decorating contests all were held at the mall during its first decade. In March 1978, there was a rock-a-thon – with rocking chairs – to benefit the Hope Haven Children’s Home in Virginia Beach. It had some rough times, too. There were lawsuits, broken water pipes, power outages and complaints about traffic congestion. And the opening of each stage of development was delayed. 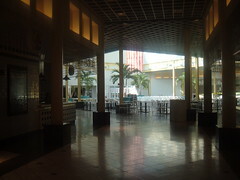 On Thursday the gates were down and the lights were out at many of the mall’s stores. Earlier this week, the mall’s general manager, Raymond Tripp, said 33 of the 100 or so stores were open for business. Tripp has been the mall’s general manager for the last 16 years. “Every day, it’s less and less,” he said Thursday, walking through the mall. Many of the stores at the mall were offering steep discounts to move their remaining inventories. “Some people say this is eerie-looking,” Tripp said, passing by a row of empty stores. At best, there were a handful of shoppers at any given store on Thursday. 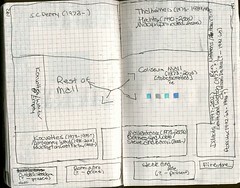 I’ve also copied the final list of tenants on the Coliseum Mall website. I need to straighten them up before posting them though. One day this past summer I wrote down every tenant I could remember as well, I need to type that up. If no date is mentioned for the anchors, that means I need help with it. Demolition begins in February on the rest of the mall. 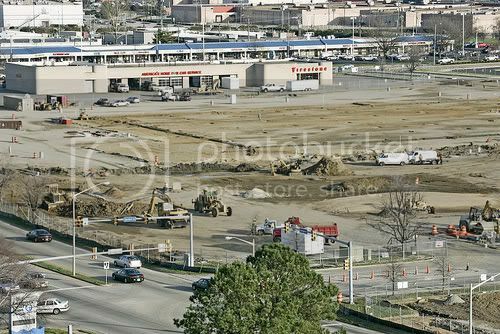 What people are calling demolition is actually deconsturction of the parking surface on the old Smith & Welton side (Children’s Palace/Proffitt’s/Dillard’s for Men) where they are preparing to start construction of the new parking garage and the new JC Penny building. The Nail shop beside where Carlton Cards was (in the Hecht’s wing, almost directly across from the now torn-down DIllard’s for Men) has a sign stating they are open and will not be moving until Mid-Feburary. Personally, I can’t see people visiting an empty shell of a mall to get their nails done, but then again, who am I? Gent’s was still open, but Rainbow is having the “everything must be sold to the bare walls!” Zale’s didn’t have a closing date posted, or a location where they would be moving to. No word on where Barnes & Noble Booksellers would be located (or if they were simply going to close up shop and build a new building — the Daily Press confirmed they would be back, but could not give specifics as to where the new store in the “Peninsula Town Center” would be). There had been a number of rumours that Burlington was staying (which would be a major mistake, in any Dead Mall fan’s book), that Burlington was moving into the old Hill’s/JM Field’s/Lionel Play World/Mr. 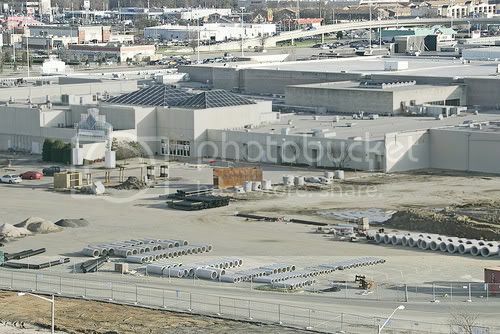 How’s/Builder’s Square location at Riverdale (also not confirmed), and the rumour that Burlington was going to move back to the original location at what is now Power Plant. That’s the least likely, as there are two hotels going to be going in behind Cracker Barrell and Texas Steakhouse. 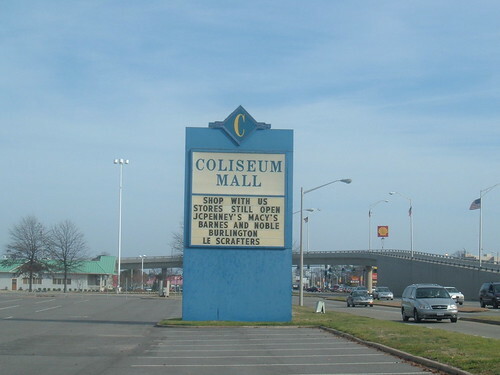 I’m happy I didn’t get the chance to go to Coliseum mall recently. It would be too sad. I still have the creepies from watching Newmarket Fair empty out through the years. Even the Chick-Fil-A cows were on hand to celebrate the final Holiday Parade at Coliseum Mall, a milestone that in many ways marks the transition to The Peninsula Town Center, a $200 million mixed-use redevelopment of the vintage enclosed mall in Hampton, Va. The cows served as Grand Marshals of the 7th annual event, which was held on Nov. 18 and attracted a crowd of more than 12,000 people. In addition to the Chick-Fil-A cows, the parade was attended by Santa Claus, festive floats, marching bands and other entertainment. 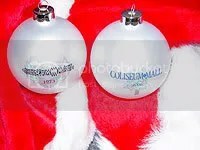 To commemorate the holiday event, Coliseum Mall designed and produced a holiday ornament that features the original Coliseum Mall logo from 1973 on one side and the current Coliseum Mall logo on the other . The 2006 Holiday Parade at the Coliseum Mall paraded down Hampton Roads Center Parkway to Coliseum Drive and ended on Von Shilling Drive. 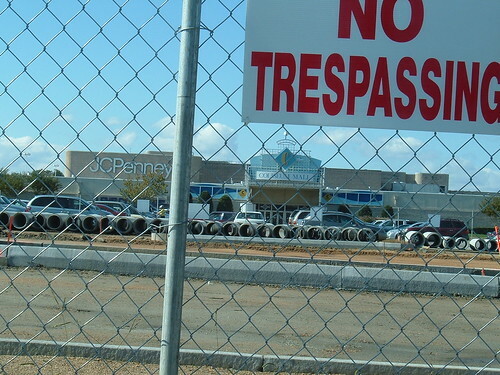 The parade went through the construction site for The Peninsula Town Center, which consists of two phases, including the pad for a new J.C. Penney’s store. This week, Steiner expects to deliver that pad to the department store chain, which will likely begin construction of its store soon after the pad is delivered. 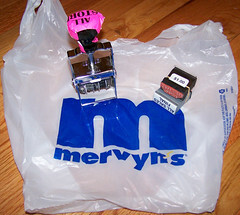 The Mervyn’s chain of department stores has stopped operating in the states of Washington and Oregon as of 12/31/06. I was in the Puyallup store when the death knell sounded — a bouncy male voice which had previously told us EVERY item of clothing in the store was 50¢, then 25¢, then 10¢, announced that everything had been sold except for the fixtures; so long, it’s been great to know ya. This left the office supplies. The compression date stamp has years from 1988 to 1993 (and universal others in that column like “REC’D” and “ANS’D”) but is stuck on JUN 18 1992. The “All Sales Final” stamps must have been used extensively this month, and only came in a two-bundle (and I can’t return one because, you know, all sales final) so I’ll likely recycle the wood block of one of them with something from my growing stack of unmounted rubber.